I've been doing tons of crafting the last week or two. Katie's asked for a Harry Potter birthday party, so we've been making all sorts of Harry Potter themed items...but I've been so busy with it all, that I haven't been blogging much. 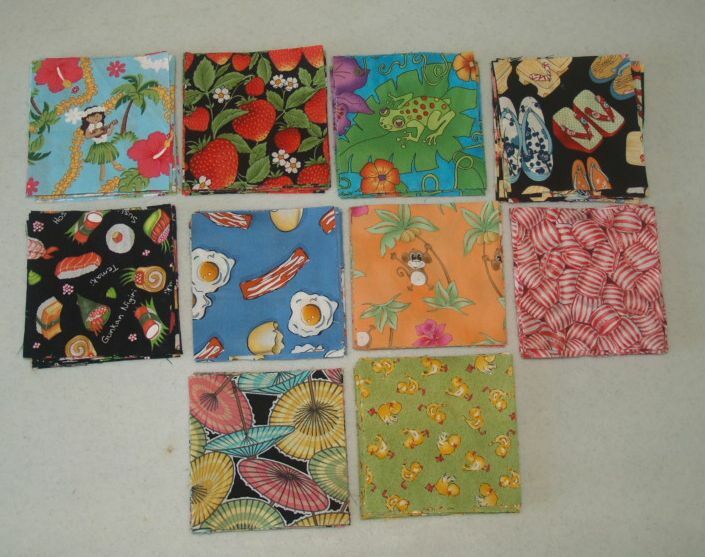 But...More and more swappers have been sending in their fabric choices for the I-Spy Swap. I'm getting really excited. I know my last post a was about my own I Spy Choices, so I thought I'd share a few of them with you. There are still a few spots open if you want to join in. Some of my daughter's birth family has connections to Hawaii, so I know she's going to go nuts for some of these squares. I love the little Hawaiian girls, and the sandals and sushi. I also loves those little umbrellas. So fun! Here are some more fun ones...popcorn, sock monkey numbers, bananas, hot dogs and more! And check out these glasses, buttons, and pigs. And I love these cupcakes and fairies and curly fries, and the other are fun too. If you'd like to see more of the fabric choices, you can go to our flickr group here. And if you'd like to join in the swap yourself, there are still a couple spots and you've got plenty of time to get your squares cut and mailed in. Just go to this post to join, or send me an email to polly.helping.little.hands (at) gmail (dot) com. I also wanted to give a shout out to one of my sponsors, eDiaperCakes for sponsoring this post. They offer a fun twist on a really practical baby gift. Having had 4 kids, I can tell you that many baby gifts while loved and adorable end up not being needed...which is why my favorite gifts were the diapers. A new mom can never receive too many diapers, which is why I think these diaper cakes are such a fun idea. One of these as a center piece would be the talk of the party. eDiaperCakes has a lot of fun themes to choose from...or they even have a Do-It-Yourself Diaper Cake options for perfect customization to your party's theme. Oh Polly, I love all these squares! I am such a novelty fabric person. Almost makes me wish I could choose which ones I want, but I really do love the surprise factor more! Thank you so much for hosting this and I am so glad to be a part of the swap!